Half of the 2018 NHSCA Sophomore National Champions are from Pennsylvania. The Keystone State brought home seven individual Champions from the sophomore division including 18 overall medalists in Virginia Beach. State Champion Hunter Catka (Sun Valley) captured the 220 pound title in the Sophomore Division with four falls including one in the finals against Cody Fleming of South Carolina in the Championship finals. Pennsylvania State finalists Kurtis Phipps (Norwin) was third at 106 pounds and Killian Delaney (West Chester Henderson) was second at 113 pounds. At 126 pounds it was an all Pennsylvania final between two District 11 sophomores Patrick Noonan (Stroudsburg) and Kenny Herrmann (Bethlehem Catholic). It was the third time this year that Noonan downed Herrmann with a (6-2) decision over the 2-time State Medalist. It was a nice comeback for Noonan who had to withdraw from the District 11 Championships, missing the postseason. Another NHSCA Sophomore National Champion who missed the individual postseason was Andrew Cerniglia of Nazareth. The 2017 PIAA State Medalist couldn’t crack into the Blue Eagle line-up, once Nathan Stefanick and Ryan O’Grady dropped down, but that didn’t stop Cerniglia from making an impact on the National level in Virginia. Another all Pennsylvania final occurred at 145 pounds when Cole Handlovic (Bethlehem Catholic) took on AJ Tamburino (William Tennent). Handlovic, a PIAA State Medalist in March, won a tight 3-1 decision over Tamburino who also missed the postseason after winning the Suburban One Continental Section due to an illness. 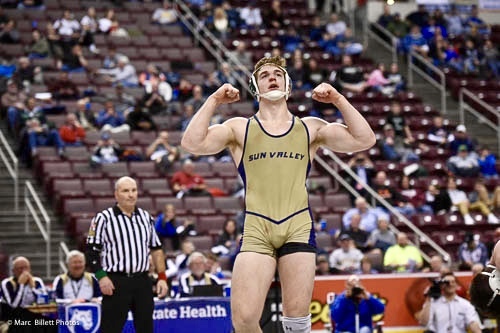 State Medalist Clayton Ulrey (Lower Dauphin) won the Championship title at 152 pounds while 2-time State Medalists Gerrit Nijenhuis (Canon-McMillan) took home the National title at 170 pounds and Gaige Garcia (Southern Columbia) captured 182 pounds.